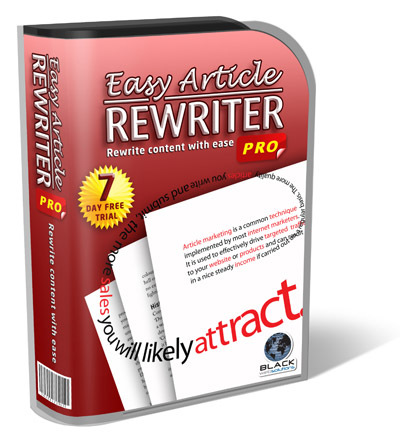 Today I want to show you how to use my Easy Article Rewriter Pro software to identify the strength of an article. This technique allows you to analyze the strength of your competitors articles in order to see how easy it would be to get your own articles ranked above them. This is a fairly easy, straightforward process. If you have already downloaded the software and are taking advantage of the FREE 7 day trial then you MAY have read my report, ‘The LSI Code’ which was included in your download. 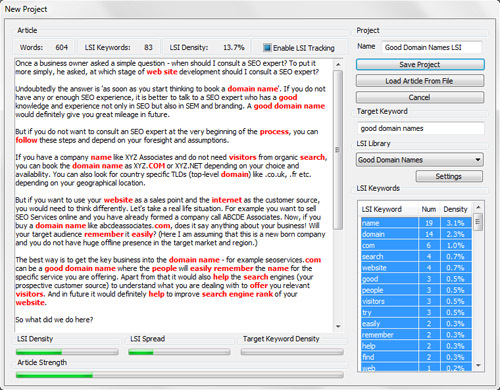 This is a 22 page document that shows you how to build ANY LSI keyword library based around ANY seed keyword phrase. In fact, the report takes you through the process of getting Google to TELL you what these words are, step by step. It’s all explained in my free report so I won’t go into details of that here. 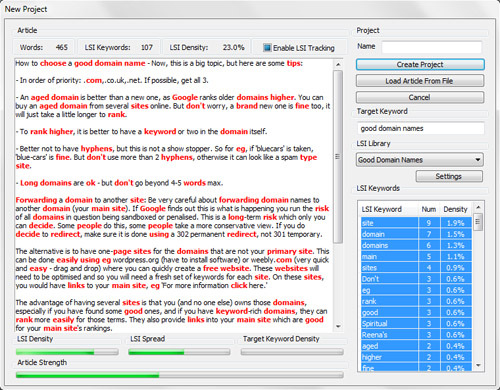 Once you have built your LSI library you can simply paste any article into the ‘New Project’ window to instantly analyze the strength of the article for your keyword phrase. For the example below I have used ‘good domain names’ as my keyword. This particular LSI library consists of 99 words. These are ALL words that Google regards as being relevant to this keyword phrase, so content built around these words in a particular way will rank naturally in Googles index. I have performed a Google search for good domain names without quotes and only retrieved pages from the website Ezinearticles. According to Google, the top article is most relevant to this keyword phrase, and then the 2nd article and so forth. You know how it goes. I have taken the first article and pasted it into Easy Article Rewriter Pro to identify it’s LSI strength. You can see by the built in article strength gauges that the top ranking article doesn’t actually include the phrase ‘good domain names’ within the article content and that the overall strength of the article is a little over 50%. This means that there is plenty of scope to improve on that and rank above it taking the top spot. I now want to illustrate to you how the software uses the LSI library to accurately show you the strength of an article. I have taken a number of screenshots showing some of the other ranked articles for that keyword phrase so that you can see how the article strength gauges reduce as the ranking position decreases. Take a note of the green strength bars at the bottom of the screenshots AND also the ‘LSI Density’ figure which is at the top of the screenshots. This is the overal percentage of the article that is made up of LSI words. As you can see by the screenshots above… as the rank gets lower and lower, so does the article strength and the OVERALL LSI DENSITY. 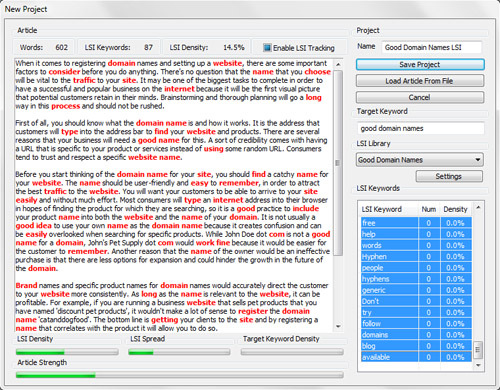 By applying my method illustrated in ‘The LSI Code’, you can use the instant article strength gauges and statistics in the software AND also the visual ‘placement and density’ functionality to completely trounce your competitors and get ALL of your articles ranked near the top of the search engines. This should result in more traffic and hopefully more sales! When you use the software to write articles from scratch, you want to aim to get as much GREEN in those bars as possible! 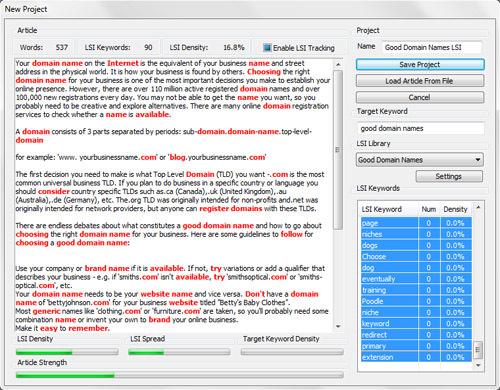 The LSI keyword stats will also update with every word you type. This library will also give you ideas of what you need to include in your article. When you select ALL the words in the LSI library they will show up red within the article itself. 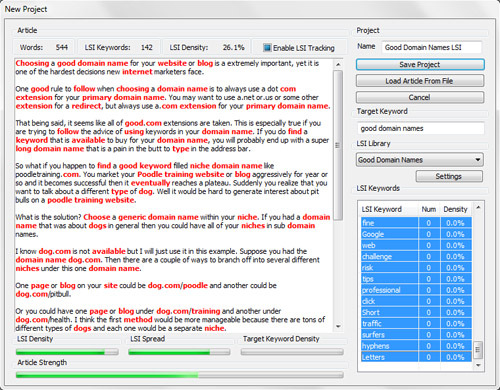 This gives you a REALLY good visual indication of the density and placement of your LSI keywords. For example, you will see that the red words in the No.1 ranked article has a higher density than the others…. and that is one of the reasons why it is currently ranked above the others. It is really a pretty neat application when you use it properly! If you haven’t yet downloaded the FREE trial, you can do so by visiting the website HERE. You do not need to enter any payment details or even supply an email address. Just download and use. Spot on Andy! While we have only recently become aware of you and your services, we have become a fan. The indexchecker tool is a great asset and we are going to give this a go! Thanks for all that you do to keep us moving forward in serving our clients. This tool looks very promising. I like the concept behind it, and the content here is loaded with awesome information! Could you tell me how I could use this software with outsourcers. Do I have to buy the software for each outsourcer? Would it be possible for you to reply to my email address. Hi Andy, same as Linda above, how many computers can we install this on? Or is there a multiuser license? You can install the software on one other machine. It allows for that. Excellent tool Andy, I’ve purchased a few of your apps, this could be the best! I downloaded the free trial and started to work yesterday with it. It is very easy to use, but impressive! So far, it saved me a lot of time. I am now focussing on the LSI report. Thanks a lot for this promising tool! 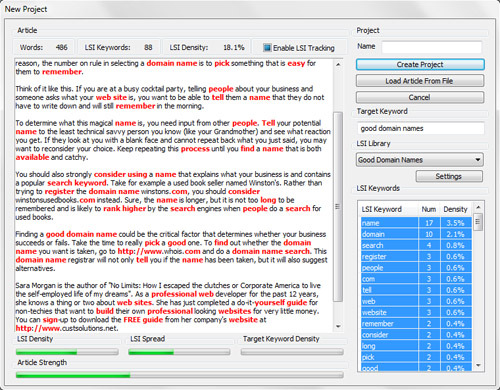 An awesome software based on the help it will render to article writers to maximize the exposure of articles. Yes, I tried it and submit an article to ezinearticles.com after checking the keyword density. Would you extend the special discount duration? Yes, I do with all of my other products. I will have an affiliate system set up for Easy Article Rewriter Pro shortly.